As divers, you all know how important it is to be aware of the dangers of the activity. Nitrogen narcosis is especially dangerous. Diving is one of the most exhilarating sports in the world. There is nothing quite like being deep in the sea and exploring the ocean. It's not only about exploring the sea divers are also essential rescue workers. Just look at how hard they worked to rescue the soccer team trapped in dangerous caves in Thailand. Without divers, that team would not be alive. If you are a diver, though, it's vital that you stay safe too no matter what you are using your skills for on a particular dive. One of the ways to make sure you come back alive after each dive is knowing what to do if you experience nitrogen narcosis during your dive. Nitrogen narcosis is a condition which occurs to most deep-sea divers at one point or another. When divers reach a depth of 100 feet or deeper is when they'll often feel the symptoms associated with the condition. The condition is most often associated with a feeling of drowsiness. That occurs when the divers are breathing in air under higher than atmospheric pressure. Many divers, will experience a state of euphoria upon reaching these depths. Divers sometimes refer to narcosis as the "martini effect," because they can't control their thoughts once it occurs. Will Every Diver Experience it? The short answer to the question is no! However, it is not uncommon for divers to experience nitrogen narcosis. Even experienced or professional divers encounter it when diving at deeper depths. Because there's no way to know how you'll react, it is essential to have an understanding before diving. Most experienced divers will know when the effects are kicking in. But, as a novice or beginner, it can be difficult to ascertain this, especially if you've never experienced narcosis. For these reasons, it is important to educate yourself on the topic of nitrogen narcosis, before engaging in deep-sea diving. Even in shallow depths, you should understand the dangers of narcosis if you're diving alone. It is always advised to dive with an instructor or buddy to help you as a beginner diver. Several signs are felt by individuals who are in a state of narcosis. 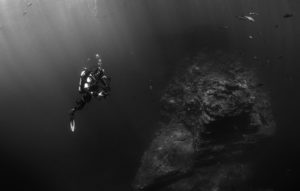 Keep in mind that no two divers are the same, but some of the symptoms include poor judgment, inattention, blindness, debilitating inertia and extreme cases death may occur. The following are also common symptoms. Narcosis will affect the diver's ability to reason. It makes it difficult for them to make appropriate decisions. It also makes it difficult for divers to choose the right course of action in challenging situations. When divers are in a state of nitrogen narcosis their think times and reaction times lag. That means they can't think or act as quickly as they would in a heightened stage. Divers may experience feelings of euphoria when nitrogen narcosis sets in. Because of these feelings, divers may feel overly confident which creates a dangerous situation. They might attempt challenges they can't handle, and otherwise wouldn't attempt, if they were in a coherent state. For some divers, the opposite occurs, and negative feelings or high levels of stress may arise when diving. If divers become stressed, it is difficult to breathe or rationalize. Narcosis is dangerous because there's no way to tell how divers will react under pressure. Coordination is also affected by narcosis. Divers have slowed down reaction times and lack coordination. It makes it difficult to perform precise movements when diving. In deep waters, this can prove challenging. That is especially true for novice or beginner divers who don't yet understand the effects of narcosis. When you're fixated on a single idea, it is harder to multitask or think about several things at once. Diving is a multitasking activity. You have to control your breathing while maintaining an understanding of your surroundings. You have to gauge your moves properly and know where your dive buddy is. And, these are only a few of the things you're thinking of when diving. When you lose the ability to multitask, diving becomes dangerous. It is one of the main reasons narcosis is so debilitating for divers. Even experienced divers experience short-term memory loss when deep-sea diving. The memory loss is so severe sometimes that divers go down to perform a specific task and once they reach deep depths, they can't remember what they were going to do. Also, the memory loss can persist when they are out of the water. For instance, the diver may not remember ever being in deep water. 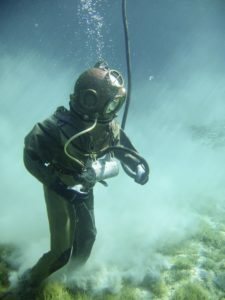 Many divers do things which further increase the risk of nitrogen narcosis. Obviously, avoiding narcotics, sedatives, and alcohol should be a given. However, diving in frigid diving temperatures can increase the risk of narcosis as well. Descending too rapidly will also increase the risk. Finally, excessive levels of carbon dioxide or fatigue may increase the risks of narcosis as well. Is There a Treatment for Narcosis? A simple solution is ascending to a shallower depth. When ascending, do so slowly to reduce the pressure felt at deeper depths. The effects of nitrogen narcosis should pass once you reach shallow water. Allowing time to pass is also going to help reduce the effects of narcosis. The amount of time it will take varies for each diver. When the heightened levels of pressure are released, the brain resumes its normal cognitive functions. Because some divers may not be aware they are experiencing narcosis, you should always dive with a buddy. They can spot visual cues or emotional cues and assist you. They can also bring you up out of deep depths in the event of underwater dangers. If any erratic or uncommon behavior is visible, a diving buddy can help get you out of a dangerous situation. If you're new to diving, you might ask, "How can I prevent nitrogen narcosis?" The simple answer is avoid diving to deeper depths. There's no scientific manner to determine how nitrogen will affect your cognitive capabilities. Especially as a new diver, it is difficult to gauge. For this reason, you should allow yourself time to learn proper technique and breathing patterns. That will create a safer environment when you do go diving. Should I Avoid Diving Altogether? Deep-sea diving is a dangerous activity. However, fear of nitrogen narcosis isn't reason enough to avoid this engaging sport. Just educate yourself and make sure you have thoroughly trained before you jump into the water. As long as you know what to look out for with nitrogen narcosis and you have a buddy, have fun diving. Going deep into the sea is something many people will never experience in their lifetime, so definitely don't allow fear to overcome your desire to dive. Also, you need to make sure you are well versed on any other dangers. If you are confident that you have been adequately trained to go diving, jump in and have fun!